I got a chance to play a very different game recently at Bookwyrm, a cool local con. Several elements set Kingdom apart: you build a collaborative setting, featuring a high level of player input and control, with very influential characters, who navigate kingdom-wide crises. Many of those elements exist in specific games—but Kingdom puts them all together smoothly. Kingdoms can be traditional medieval nations, but the concept is very flexible. Running examples in the book include a fantasy city bordered by barbarians, an old west town, and colonists on an alien world. The book is made for pickup play; in fact, there are a few pages (set aside as white text on a black background) that are made to be read aloud via passing the book after each column is read. It’s set up that way intentionally, to encourage people to participate from the very beginning—and deemphasizing the guy with the book as the font of all knowledge. The game is filled with excellent advice on building a setting with your group, including some “work backwards” advice if people don’t gravitate to an idea quickly. Building your Kingdom has a lot in common with pitching a series premise in Primetime Adventures. Starfall is the arms dealer to the universe. Our weapons don’t win battles, they end wars. Will we be neutral, selling to the highest bidder? Will Starfall sell weapons to the Warlords of Hanat, who have already enslaved a pair of planets? Together, we’ll see how Starfall deals with a succession of crises… will Starfall’s weapons lead to a golden age, or incite terror and chaos in the universe? Starfall’s home is [a sunless mobile planet pulled free of its star and hidden in the depths of space | an artificial world station locked in the folds of warp space | a flowering utopia carved from the hollow core of a seemingly barren moon]. It may be foreshadowing when I tell you that we wound up picking none of the above; our version of Starfall was located low in the mists of a gas giant, spread across floating platforms. There are several more things to customize; a series of prompts, pick lists, and check boxes helped us build a unique version of Starfall, primed for action. The format helped everyone dig in and contribute strongly. Once you have a setting, including some looming threats and vibrant locations, it’s time to create characters. Your character is strongly tied to the Kingdom—if you can just walk away, you haven’t made a valid character. Characters have several elements, though they lack numerical stats and skills. Instead, characters have a role—how they impact and change the Kingdom. (More about roles in a second.) Beyond roles, characters have bonds to two other characters (corresponding to the players sitting to your left and right)—which are somewhat similar to creating the relationships with other characters in Fate games. Characters have an issue—which, like issues in PTA, is something that holds you back, something that you should expect to see in play a lot and be excited by as a player (even though your character hates it). You also create a wish or fear for your character—which helps us see what we can steer the game towards to engage you. Characters tend to be movers and shakers within the organization—but that’s not always true. Every character has a role—a specific way they interact with the rules. The three roles are Power, who makes decisions for the Kingdom (whether that’s what the org chart says or not), Touchstone, who decides and reflects the average person’s attitudes, and Perspective who understands the kingdom and predicts the results of the crossroad. In our game, the first challenge that we confronted were spies… and our decision was about how we were were going to punish the planet that had set the spies to us. Along the way, the Inquisitor (who was Perspective) told us that dire things would happen if we didn’t punish Ivix. As Perspective, what he stated was true in the world; if we’d decided not to crush Ivix, the other planets would have been emboldened and we’d have lost confidence in our place apart. Of course, it was also predicted that if we didn’t crush Ivix, the galaxy would become a more peaceful place. That, ironically, was part of what goaded some of the characters to punish Ivix… a peaceful universe purchases fewer arms. Our man in HR was a Touchstone; what he said he was feeling (as his character) became the baseline for what the average person in Starfall was thinking. It was subtle… and dangerous, as his desires were often askew from the power brokers… or even the Inquisitor. The game is played as a series of scenes. Ben gives advice on how to set a scene that is so good that I printed out the linked excerpt so we’d have another copy to pass around. The players go around the table, in order, creating a scene with their character reacting to events or discussing the upcoming decision. In the scenes we learn who the characters are and what matters to them, and define much more clearly what’s at stake if we decide one way or the other at the crossroads. It’s free roleplay, mostly, with characters subtly indicating if they’re invoking their role to make true predictions, or emphasizing that while their character may say that they feel like they’re the only one who feels strongly about an issue, we see that they’re the touchstone… so it’s a widely held belief. Our scenes included meetings in virtual reality, menacing discussions in the Inquisitor’s chambers in front of captured spies, an elliptical conversation where security threatened the Director’s brother on the street in front of his house (but not by name), and talks about techniques of destruction while looking out at the churning storms of the gas giant. Most of what went on was “just conversation”… but that conversation revealed the characters and their beliefs very efficiently. Have you had a chance to play Kingdom or its sister game, Microscope? Do you enjoy collaborative setting building and exploration? What do you think of playing the power brokers of your game-world in Kingdom to set the stage for your next D&D or Pathfinder game? Opinions, questions, and advice all welcome! This post is brought to you by our wonderful patron Benjamin D Horning, supporting us since August 2016! Thanks for helping us keep the stew fires going! I’ve only played it once, but I loved it and need to play it again. We made our own setting (daring! ); it was a creepy London carnival. We had…a fortune-teller, a diabolical manager, a squid-man-thing, and a troubled priest. It ended in wonderful disaster. Which character was yours and what roles did you get to play? It was quasi-historical Victorian. I was the squid-man-thing (co-opted from the browser game Fallen London, actually) who lived around the ominously-named Well of Souls in caves beneath the carnival. A thing of note: because Kingdom let me verbalize my role after a scene (I was Perspective for the game; as it was our first, we didn’t challenge/overthrow very much), I was enabled to play a character who didn’t conventionally communicate. There were whistles and tentacle wriggles and the dropping of stones into a jar, and I used that (cryptically) to communicate intentions and emotions during a scene. It was quite unusual and enjoyable to try that! Thanks, Scott, I will definitely be trying to pick these up in the future! Double-cool bit: Kingdom actually has advice for playing in tandem with Microscope! Yup! One of the people I mentioned Kingdom to wondered if the two would work together; he was very pleased when I relayed that there are a few pages of specific advice on merging them. Have you played the two together? Unfortunately, no. I haven’t yet gotten to play Microscope. Glad they sound good to you; I’m interested in checking out Microscope myself. Kingdom is a game style and concept I’ve long loved. It was problematic back when it was Aria [though I have very fond memories of playing Interactive Histories], and enjoyed using Dawn of Worlds to build a setting where the Evil Dwarven Empire was the foil to the PCs. I even created an Amber derived game with a similar concept for my local group; it proved a fun enough one-shot. Kingdom does a better job at the parts that I want to concentrate on. It captures the characters and interactions… honestly, it could be half of the rules for a settling like the Deryni books that I love. I haven’t played either Microscope or Kingdom yet, but I’ve been watching both of them throughout their development with an interest in eventually (curse the limitations of only having 24 hour days!) using it to do world building with a group for a longer running campaign. If anyone has any experience doing something like that with their home group, I’d love to hear about it! It was a whole lot of fun to play. At some point in the future (when I find the time), I will co-opt Kingdom for developing the setting I run a Pathfinder game in. I’ll guide my players through the development of the local rulership, merchant’s guild, and thieve’s guild. Then start the Pathfinder campaign with a fleshed out setting. That should be awesome! One of the neat things it’ll do is give them some investment in the setting–because they know where the community’s come from, they’ll appreciate its problems more. I got to play a game of Microscope and they sound fairly similar. One thing we did in Microscope, that was a lot of fun, was spend a little time on characters during scene setup. We borrowed a little bit from Hillfolk and had each character briefly state what they wanted (emotionally) from other characters and why they couldn’t get it. 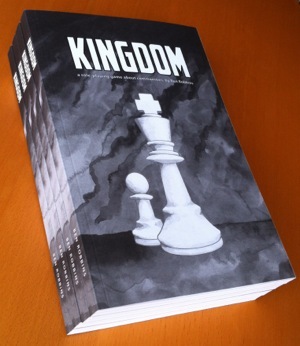 A really sneaky thing to do would be to use Kingdom to advance the plots of a group of bad guys in your campaign. Turn to a different group of players, assign them each a member of the villain organization, outline the problems the PC’s have caused the organization, and let these players role play through how they decide to deal with the threat. Heck, you could run two separate campaigns, with the players of each campaign playing heroes and also forwarding the evil plots of the antagonists in the other group’s campaign using Kingdom.